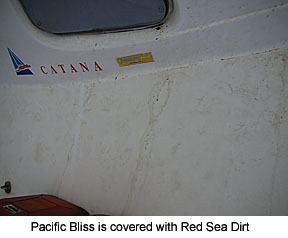 Pacific Bliss has not berthed in any “real marina” between Yacht Haven in Phuket, Thailand last January and Abu Tig Marina in El Gouna, Egypt this April. So this story about three marinas is a rare departure for our Voyage Six. And how nice it is! 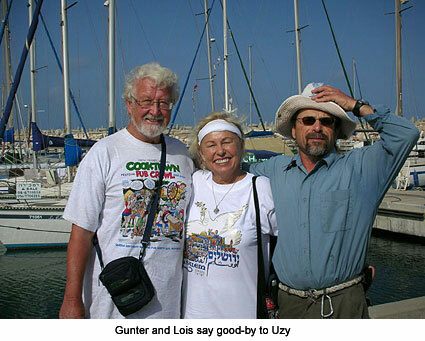 Arriving in the Ashkelon Marina after voyaging for months through Arab lands was a breath of fresh air. What a relief after Egypt! Customs was quick and easy. Since we’d called in our ETA via VHF, the customs man had come into the marina on this, a holiday for him, to check us in. A refreshing sartorial departure from Southeast Asia and Arab officialdom, he was casually dressed in a polo shirt and shorts; his young son stood by his side at the computer. In less than an hour we had completed the formalities and were on our way to the restaurants beckoning along the quay. Gunter and I, along with our friends Joe and Michele—our expert cruiser-crew—enjoyed an arrival lunch at a red-and-white canopied fish & chips restaurant. We had not really planned to stop in Ashkelon, only 11 km from the Gaza Strip. Heeding a warning from cruisers during our overnight stay in Ismailia, the half-way stop in the Suez Canal, we had decided to head for the new Hertzliya Marina north of Tel Aviv. Many of our friends planned to go there. The Israeli-Lebanon war of 2006 was history but to the south of Israel, tensions were high and rockets from Gaza were being rained on Israeli civilians. We departed Ismailia Yacht Club at 0600 for the second half of the canal. Our canal pilot, Mohammed Ali (no kidding—that’s his real name) jumped off Pacific Bliss and onto a pilot boat in the middle of the channel at Port Said. We followed a buoyed separation scheme and by 12:45 on Monday, May 21, we were in the Med, back in the Sea where it all began. What joy! Gunter and I high-fived in the cockpit as a pod of dolphins welcomed us. This was a good sign, since the dolphin is our ship mascot. We had begun this mission in Canet, France back in 2000—almost seven years ago. 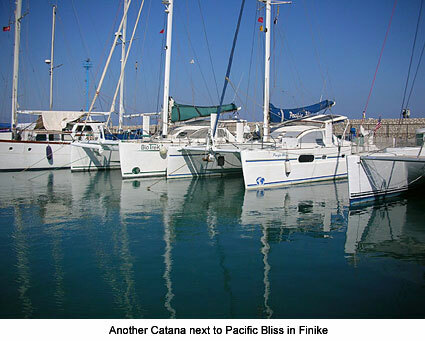 We reminisced about our first visit to the Catana factory. How naïve and clueless we had been back then! We set a course for Hertzliya, only 24 hours away, making sure to stay well offshore of southern Israel, as counseled by the Red Sea Pilot. The waves were short and choppy, the wind almost on our nose, reminding me of our passage along the Spanish coast during Voyage One, our maiden voyage and the longest of the Seven Voyages. During the afternoon, I decided to call to give them our ETA. I had already made reservations. “Then proceed into Ashkelon, which is closer. You’ll be there in the morning, clear in there with immigration. Then once you’ve cleared in, you could proceed on to our marina. We are open until 4:00 PM.” She gave me the course toward Ashkelon that would still give Gaza a wide berth and avoid some drilling platforms in the sea. 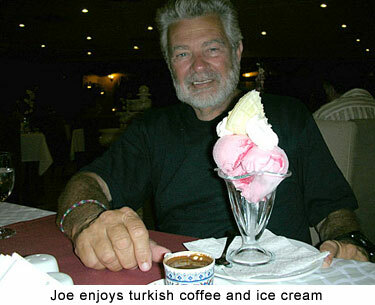 Joe plotted the new course which showed us going farther north—actually to Ashdod. Then we would have to turn and follow the coast south. It didn’t make sense, but we rerouted per the new instructions and Pacific Bliss motored on. The seas calmed towards evening as we enjoyed pasta bolognaise with garlic toast seated around the cockpit table. The sun set over glassy seas—a red ball dipping fire into the Western Med. On watch again on the morning of May 22nd, I watched the sun burst behind a cloud bank, fanning streams of golden light into what I call a “creation sunrise.” I knew that God had sent his angels to watch over us. From the cockpit, I watched the sea undulating, topped with soft ripples as the sun beamed a path directly to Pacific Bliss. Will Israel be our promised land? Will we be safe there? Somehow I felt drawn to the country. I wanted to land there. 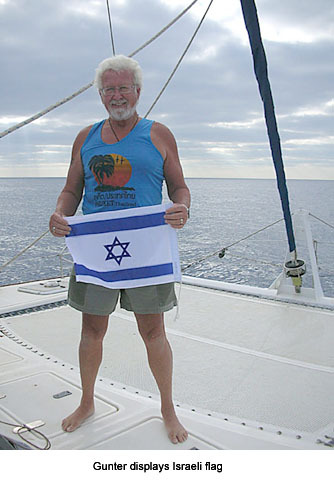 At 0600, Pacific Bliss was within 30 miles from the Israeli shoreline. I needed to clear in with the Israeli Navy as cautioned in the Red Sea Pilot: “Call the Israeli Navy on VFH # 16 when 30-40 miles offshore.” I called twice but there was no answer. I waited awhile and called again. We were 25 miles offshore, and I was concerned. I overheard a commercial vessel who gave a much closer position (about 10 miles per the radar screen) and they weren’t answering him either. That caller sounded very nervous. Then the Haifa Port Control called the ship and took its position and course. “Don’t worry about the Israeli Navy,” the cheerful Port Officer said, “When they want you, they will call.” I followed suit and called Port Control as well. I wanted someone to give me permission to turn and set my course for Ashkelon. The port control officer recorded my ship info, including crew list, passport numbers of each, last three ports visited, etc. Then he said in a deep, clear voice, “Welcome to Israel.” I breathed a sigh of relief and changed course. Eventually a woman at the Navy returned my call. I told her my position and that I had already turned. Later I received another call from her. 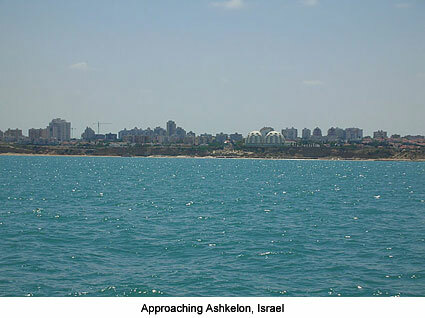 Go on course 135º toward Ashkelon for 10 miles, then proceed to marina. I was already on course 131º so only a slight change was needed. Joe came up into the salon. He took down our Egypt flag and hoisted the Israeli and courtesy flags. By 0925, an Israeli Navy ship was circling our yacht, guns pointed—not a warm-and-friendly experience. During the 360º circling, they asked for all our ship and crew information. As they headed off, the VHF crackled again and another voice said, “Thank you. Welcome to Israel” in a much friendlier tone. We must have checked out OK.
About 1 hour out, I tried to call the Ashkelon Marina with our ETA. They did not answer. Then Israeli Navy woman I had talked with before broke in and said that I should contact the marina by phone. I explained that I only had an Egyptian SIM card in my phone. “OK, stand by,” she said. Then she called back and said she had notified the marina and that we could call via VHF when we actually reached the marina. Evidently the Navy wants tight control of the VHF # 16 channel. So be it. 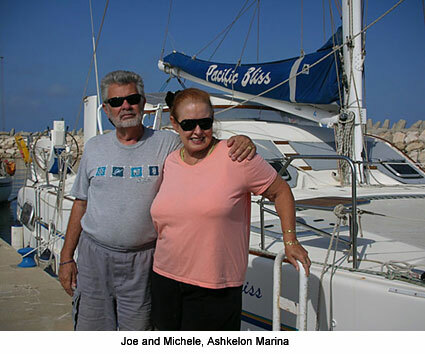 During our 9-day stay at Ashkelon Marina, the staff treated us like royalty and catered to our every whim. We had plenty of water pressure to finally wash off all that Red Sea and canal dust. When the WI-FI didn’t work at our dock, we were invited to use the internet in the office of the marina manager, Hillal. When we wanted to go into town to provision, another marina employee said, “Don’t take a taxi there; I’m going anyway. I’ll drop you off at the best market.” When we wanted to line up a tour, Uzy advised us what to do, how to take the bus, etc. The day we left for Jerusalem, Hillal “just happened” to be going into town that morning, and drove us and our luggage directly to the bus station. The staff was always helpful and courteous, and happy to answer any questions we had about Israel. When we left the marina, we said fond good-bys to Hillal, Uzy and the others. I rate this marina as the friendliest of our entire circumnavigation. As for leaving and proceeding on to Hertzliya? I didn’t even consider it. I wanted to give this less-than-half-full marina our total business while in Israel—shell-shocked or not—but that’s another story (see Sights and Sounds of Ashkelon). Insert Photo album here of 04A-08. We had waited in Israel for three days for an appropriate weather window, since a storm was raging over Cyprus. 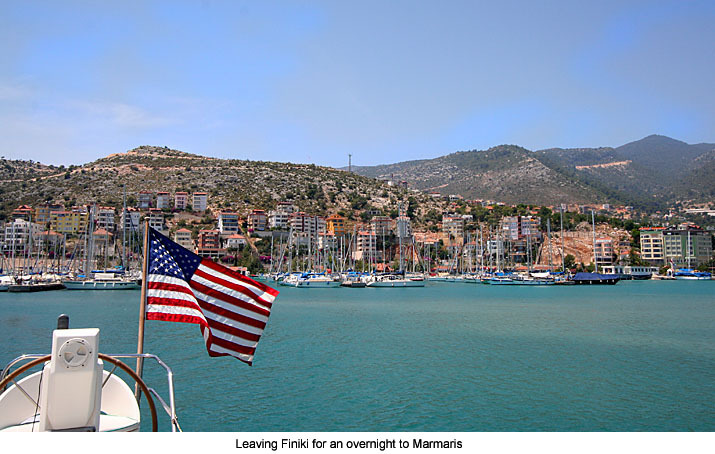 Because of that delay, we had decided to set our course directly for Marmaris and dispense with our plans for a little coastal cruising along the way. Even so, when we finally left Israel on June 1st, the waves in the Med were still steep and confused. The wind was only 8-12 knots, but right on the nose. For the first 125 miles or so, none of us sat in the cockpit; it was simply too rough. The one person on watch would usually sit inside at the nav station, just checking outside every 10-15 minutes, while the others slept or read in the hulls. For the first time, our monohuller friends Joe and Michele got to experience the unpleasant “bombs” that occur when a catamaran goes to weather—the jolt of a wave breaking between the two hulls. The good news was that with four experienced sailors, we each had nine hours to rest in between watches. The unpleasant voyage nudged Michele into compiling a list called “What I don’t miss about cruising,” which she plans to post on her website: www.migitana.com We also began to compile lists on two other subjects: “What I miss about cruising,” and “Expectations and Realities.” Next year, at the end of our circumnavigation, I plan to post my own lists. So many acquaintances think that we are happily sailing off into the sunset on glassy teal seas. I never did figure out how one could actually sail on flat seas, since sailing would require wind and too much wind can, of course, make one quite unhappy. But our close friends, and those of you who read my website regularly, know the rest of the story. Hey, if it were easy, the seven seas would be filled with circumnavigators. In reality, we are a rare breed. “They say, even with a westward navigation, the wind is on the nose about one-fourth of the time,” said Michele. “It seems like more than that,” I answered. “Thought you were talking about possibly spending another summer in the Med after we tie the knot in France,” I countered. The next day, June 2nd, Gunter was concerned about the fuel situation. With both engines on, we had been making only 5.6 knots against the steep waves. So we came up with a new plan: Head to Finike, where the coast of Turkey juts out, saving miles, shut off one engine to save fuel, check into Turkey there, get fuel, then take another passage to Marmaris, our final destination (only 112 nautical miles up the coast). We made the turn, and the wind cooperated by shifting another ten degrees to WNW. We could actually sail! Joe and Gunter raised the main and unfurled the jib. We were doing 6 knots. When the afternoon wind came up, we shut off the iron jenny, still doing 6 knots in a 12-knot westerly. Not bad. 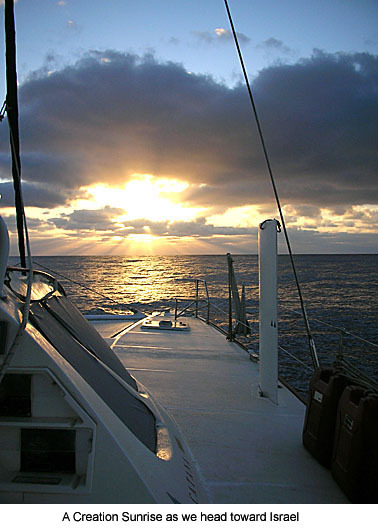 Pacific Bliss was showing off—on a beam reach, her best point of sail. All four of us were in the cockpit, enjoying the sail, knowing that these perfect times are so, so rare. Perhaps we should sail a second season in the Med...We were thinking positive again. Rocking in the gentle arms of Pacific Bliss, I wondered how we would ever be able to sell her. As we passed Pathos on the western tip of Cyprus, I thought of the Apostle Paul’s voyage there, described in the Bible in the book of Acts. 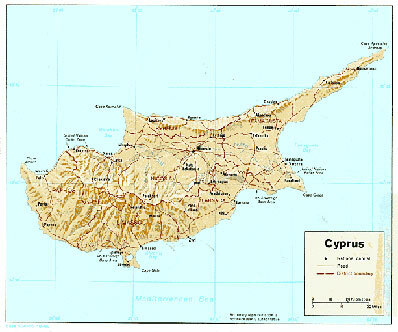 Paul, originally Saul, was born in Tarsus in what is now southern Turkey. 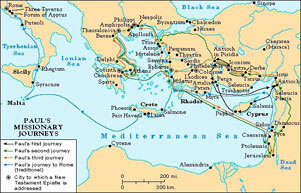 He had sailed to Cyprus with Barnabas and John Mark on his first missionary journey with them. Of all the apostles, Paul was the traveler par excellence. His travels throughout the ancient world were real feats of bravery. I wondered how he managed it, given the difficulties of traveling during these times. On Sunday, June 6th, Joe first spotted land on the radar during his 3-6 AM watch. As I came on watch at 0600, the sun was breaking through above the mountains on the peninsula to our starboard. What a grand arrival in Turkey! Gunter took a look at the land and then went back to sleep. But Joe was far too excited to go below; he rushed around the cockpit of Pacific Bliss, looking through the binoculars. “I’ve just sighted two contacts,” he informed me. We tracked the ships’ direction on the radar. I poured a cup of Turkish coffee (purchased in Israel) for both of us. Strong. How I missed my Starbucks! As the engine hummed away on a calm sea, I reviewed our track on MaxSea; we had crossed all of the Eastern Med; there would be toasts to Turkey tonight! We motored into Finike marina and headed directly to the fuel dock, where we topped off both tanks. Everyone employed by the marina was right on the ball. When we reached our designated berth, a boat boy in a dinghy help us maneuver into a tight corner spot to med-moor. On the dock stood Patrick of Aldeberan who helped us tie up. Med-moored right next to us was another Catana, a 472 called BioTrek. Its owner, Pierre, soon introduced himself. “I know you two, you’re famous,” he began. 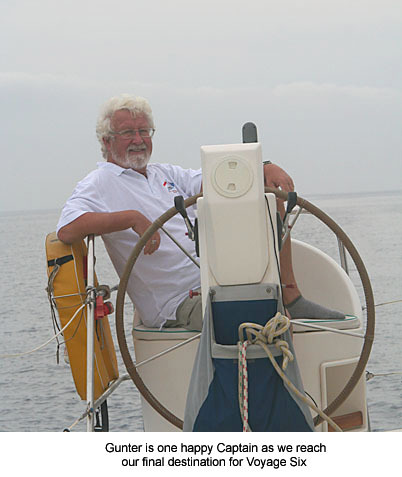 “I’ve seen your sailing stories and photos in magazines and of course, your website, which is linked to Catana’s.” I felt at home already. This would be fun. “You’ll love the shower facilities, voted the best in the Med,” another cruiser volunteered. “And the little garden is gorgeous.” After getting settled, I couldn’t wait to check out those facilities and walk around the grounds. Yes, Finike is indeed a joy for cruisers—especially those of us weary of the “basic” conditions in the ports in which we were forced to anchor out: Salalah, Oman; Aden, Yemen; Massawa, Eritrea and Suakin, Sudan. We purchased a couple of newspapers and stopped for a cappuccino at a German restaurant. That evening, we went to dinner at that same restaurant where the proprietor had put together a “cruisers special.” I ordered shepherd’s lamb as a main course; it was tender, nicely spiced, and delicious. Of course, as always, the best part of the meal was the cruiser camaraderie. Represented at the table were Aldeberan, BioTrek, Cap d’Or, and Forever. The next morning, I wandered around the marina on a photo walk, over the bridge crossing the babbling brook, along a path between flowering lilac-colored jacarandas and red hibiscus. I realized that I could be very content in Finike, providing we would choose to haul out here. The decisive point was that Finike did not have a lift wide enough and that they would have to use a crane. We had planned store Pacific Bliss in Marmaris, but realized that Finike was another option. 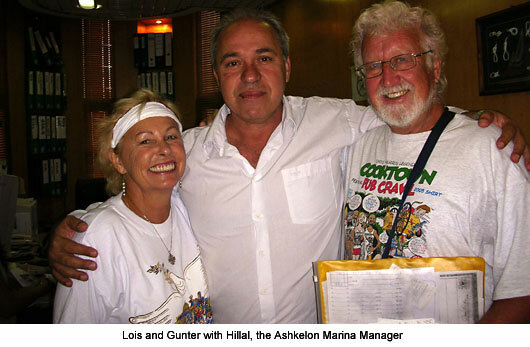 We planned to do an overnight to Marmaris and needed only 24 hours, so we had Monday morning to check in and check out of the marina and to process our entry paperwork for Turkey. We were at the marina office by 0930, per their instructions. It took two hours for the processing. The boat boys dutifully loosened our lines from the mooring buoy; we cast off our dock lines, and had our lunch along the way. 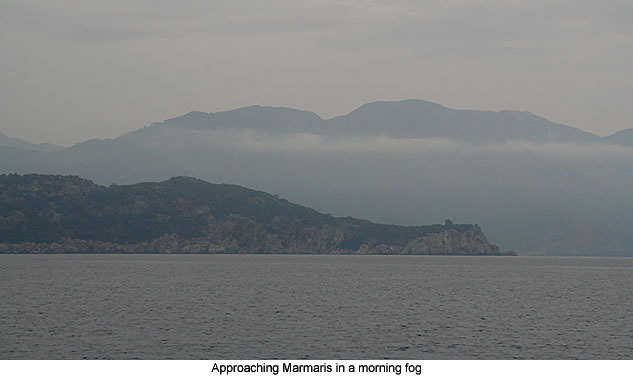 We had a pleasant overnight to Marmaris, although we never did get to raise the sails on this, our last passage of Voyage Six. Pacific Bliss hummed along at 5.5 knots over glassy seas. At one point, the afternoon breeze came up along the Turkish coast—15 knots, 18 knots, then up to 22 knots, with lots of whitecaps and foaming crests. But no bombs this time: the wave height was subdued, being protected by rings of mountains. Envious, we watched small sailboats tacking in and out of little marinas, but since we were following the coast, we had the wind right on the nose. “Be patient,” said Gunter (of all people). “We change course at an ETA of 1820, then we can at least pull out the jib.” But as we turned, the wind shifted, evidently following the coastline as well. So it was “on the nose” until the wind died down later in the night. It reminded me of our slog up the Central American and Mexican coast during our Voyage One (see Papagayos, Tehuantepeckers, and the Baja Bash). The only excitement was during Joe’s watch. At 0325, a plane flew over low, then turned on its spotlight. There was no voice contact. Then another plane flew over, followed by a group of planes. 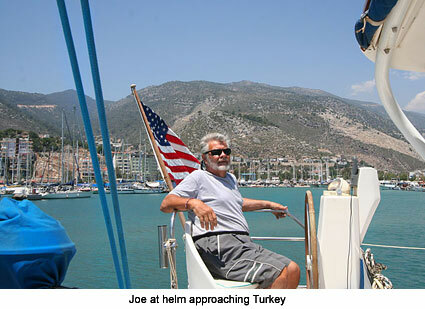 Joe concluded that it was the Turkish military, bored during the early morning hours, conducting touch-and-go maneuvers, using Pacific Bliss as a base. The Turks had announced live ammo practice, but the coordinates given were far away, in the northeastern corner of the Med. 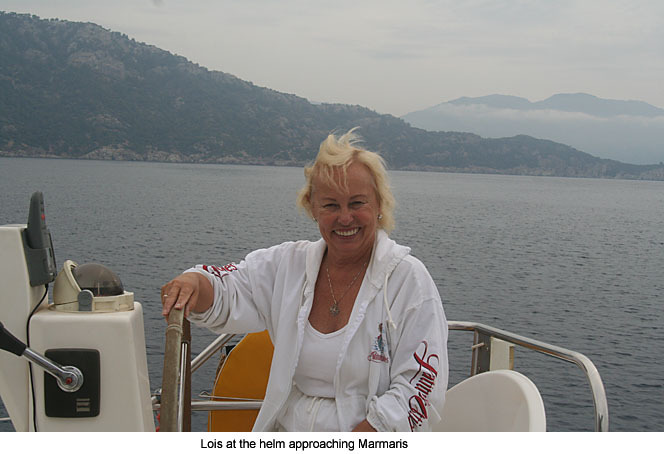 As Pacific Bliss wound around bays and inlets proceeding into the town of Marmaris—and then toward the marina—a mist rose from the surrounding mountains and blended with the shore. It was a stunning scene. A white luxury cruise ship had overtaken us during the early morning hours. Occasionally, we would spot a traditional Turkish gulet, trimmed in orange and gold over a richly varnished, dark brown wood. Well, one way to deal with uncertainty is to have a sundowner. I unpacked our “real glass” wine glasses for the occasion. We filled them with champagne Michele and I had found in the marina supermarket. “To the completion of Voyage Six,” said Gunter as we all clinked our glasses in unison to achieve that resonant sound of bliss. We changed clothes and walked to the marina restaurant for dinner. I have never seen such a grand restaurant at a marina facility! Beige cloth tablecloths, napkins, and contrasting red table runners. Flowers. Centerpieces consisting of colored oil candles set into in heavy glass containers. Floor-to-ceiling glass windows on three sides with views of a long lap pool and the deep blue sea. A modern stainless steel chef’s kitchen. 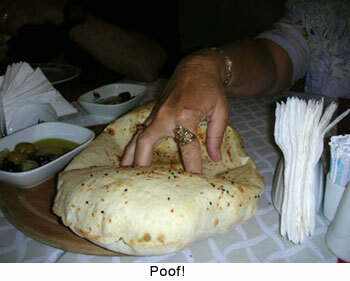 A football-sized loaf of bread was set on our table, filled with hot air. 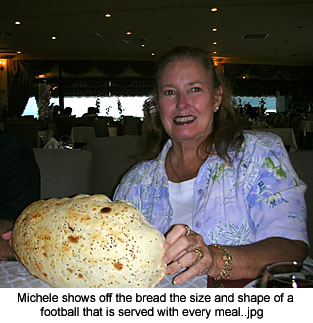 Michele popped the bread. We tore off pieces and dipped them in oil and vinegar, the warmth causing it to melt in our mouths. 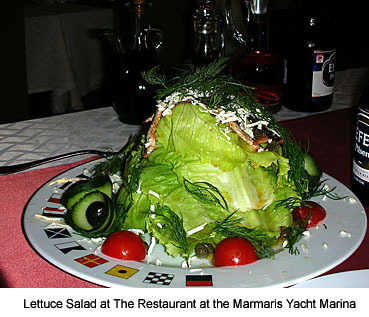 Our salads consisted of almost a head of fresh lettuce tossed with olive oil and piled high, topped with fresh dill. We each ordered a different dish; they were all excellent and presented as works of art. We could get real comfortable here!